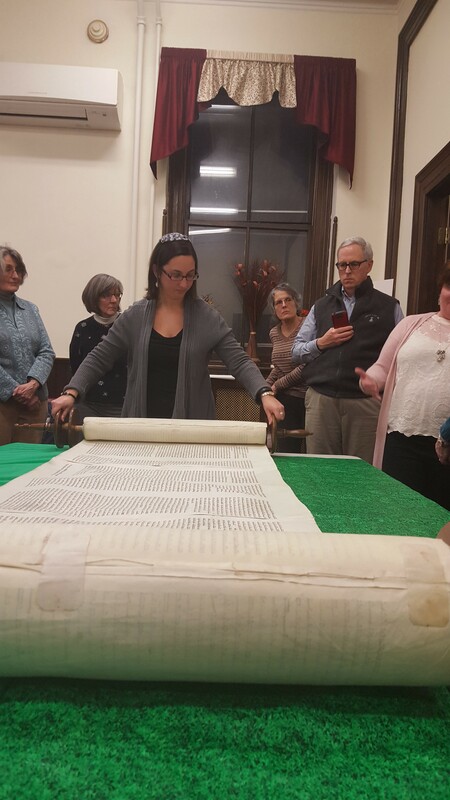 On Wed. evening, 2/25/16, Rabbi Berkowitz and Vassar Temple took our Torah on a road trip for our “Torah-to-Go” program to the First Congregational United Church of Christ (on Mill St). 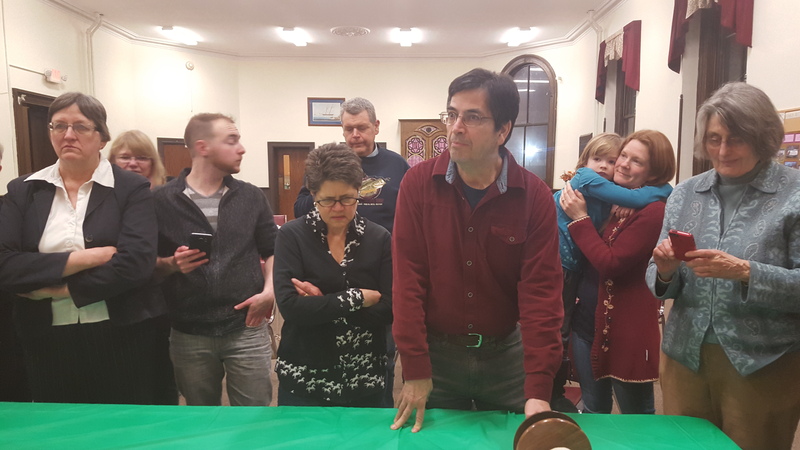 We teamed up with their congregation at their FCUCC’s Lenten Soup Supper in order to provide their congregation a special chance to see a Torah scroll up close and personal. Their congregation made us feel right at home by making and serving matzoh ball soup and challah! How thoughtful, and yummy! Andi & Paul Ciminello of Vassar Temple said, “We were so very proud to assist Rabbi Berkowitz with the Torah-to-Go program. 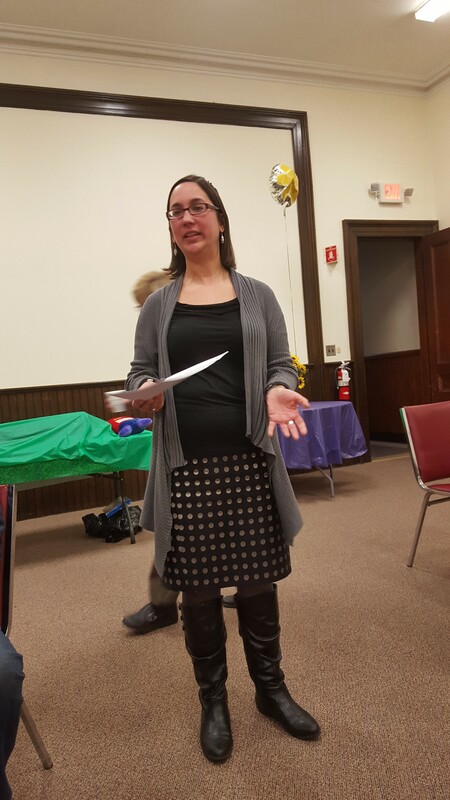 Leah gave a basic introduction for Reverend Heather and her enthusiastic parishioners, most of whom had never even seen a Torah. The presentation was excellent and the group got to see first-hand a Torah scroll, as Rabbi Berkowitz took us on a journey through the five books. The Torah-to-Go program serves a multiple important purposes. To begin with, we are caring for our scrolls. 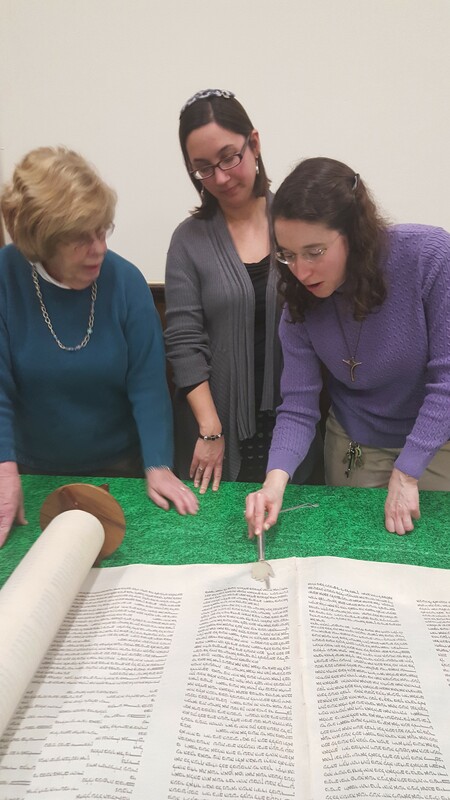 By unrolling and rolling the scrolls we are helping to keep the parchment/skins which the Torah is written on soft and pliable so they don’t crack and are less likely to tear. For another, we are building relationship with other faiths and faithful people in our community. Our clergy and our congregations can benefit it ways that we can’t even calculate. Last but not least, everyone learns and has a fun time! So please join Rabbi and friends at our next Torah-to-Go event, which will be promoted in our bulletin, email announcements and on Facebook. Check out Rabbi Berkowitz’s Guest Spot on You Leading You! This was my first “audio” interview. I was so fortunate to work with Sean Ackerman from You Leading You, a great podcast on leadership and self-actualization. Sean was an encouraging interviewer and asked thoughtful and thought-provoking questions. Here is the link to my conversation with Sean Ackerman: You Leading You Episode 130: Leadership and Faith in Life with Rabbi Leah Berkowitz. With many thanks to Vassar Temple President, Bob Ritter, for introducing me to Sean and You Leading You! Rabbi Berkowitz gave her Shabbat sermon last night, 2/12/16, on the news below out of Israel. The news about an enhanced egalitarian prayer space at the Kotel, the Western Wall. Rabbi didn’t just report the news. She asked us to think about the meaning of the news. Was it a victory? For whom? And, if so, who lost? I admire the way Rabbi Berkowitz engages us. Rabbi poses questions to us and invites us to share our thoughts and opinions. In this is way our community grows in understanding and respect. Rabbi is teaching by drawing us out – by engaging our each and every mind. Surely Rabbi’s own knowledge and views are valued, but Rabbi’s process reminds us that we all have a role too. And, Rabbi gives us opportunities to exercise our role by providing us with actionable ways we can make a difference. By empowering us our Rabbi is helping Vassar Temple to make a greater difference and to do our part, individually and as a community, to build a better world. Each Friday evening YOU have an opportunity to be part of the wonderful way Vassar Temple is growing. We are growing by helping you, our family to grow. Vassar Temple’s tag line is “Where YOU Belong.” Come see and experience why that is very true. Sunday, January 31, 2016; NEW YORK, NY – In the most significant development in the nearly generation-long campaign by Women of the Wall and their allies for religious equality at the Western Wall in Jerusalem, the Israeli government today approved the creation of an enhanced egalitarian prayer space at the Wall, which, for the first time, will be under the authority of non-Orthodox leadership. The government’s proposal – which is the result of a coordinated effort by the Reform and Conservative Movements, both in Israel and in North America, Women of the Wall, and the Jewish Federations of North America – calls for a significant revamping of the Western Wall area to create a more unified relationship between the three prayer areas (men’s, women’s, and egalitarian). The existing egalitarian space – near the area known as Robinson’s Arch – will be enhanced by the creation of an expanded platform with more access to the Western Wall, including from the ancient Herodian street. The site will be open through the main plaza by removing existing visual barriers and building a new, inviting entrance. The approved proposal was the result of several years of intense negotiating, advocacy, and leadership, led by the North American Reform Movement and Women of the Wall and developed by Cabinet Secretary Avichai Mandelblit, Jewish Agency Chairman Natan Sharansky, and the prime minister’s office. In weeks and months to come, the North American Reform Movement will work with its partners in Israel to implement the proposal and to celebrate this new arrangement, which will allow all Jews to experience an egalitarian prayer space at the holy site. Here we find more detail with respect to other rules of conduct, observing the Sabbath and festivals and the rewards that are promised for our obedience. “”When my angel goes before you… and when I annihilate them (your enemies such as The Canaanites, Moabites and Hittites.) From a modern perspective this is a nihilistic and savage view. It is an intolerant and jealous God – not only as to other gods but as to other cultures. As we move from the Torah to the Prophets God moves from being parental to marital. In ancient societies religion was a part of everyday life that it isn’t today for most modern cultures. No separation between church and state so things like war, treaties and political decisions all have an immediate and important religious dimension. In the early text such as Exodus there is a permeable boundary between divine and human. To have a divine being such as an angel creates a theological problem in monotheism. In retrospect it appears that none of these things promised as rewards and punishments really happened – unless they are still happening – very slowly. This is a problem for the rabbis who start thinking of an afterlife because of the perceived lack of justice in the actual world. The notion of an afterlife is a convenient panacea. LL: Some of this seems to be hyperbole akin to what the coach says during halftime in the locker room. It is over the top exhortation and should be recognized as such. RB In the Mishnah the rabbis acknowledge that they have no idea why bad things happen to good people but agree that we are responsible for enforcing justice in this world. In our society the boundaries between different peoples are thin – which brings the question as to how far that should go. RR Sounds like the concern of the author is to proceed gradually so as to avoid a return to chaos. Consider Jim Carey in Bruce Allmighty https://en.wikipedia.org/wiki/Bruce_Almighty Prayers are not being answered so the deiffied Bruce winds up answering all of the prayers “yes.” Bob R – when the Imam was here he warned us to be aware of the things in scripture that are “seeds” of the problems we have today. Scripture has to be read with a filter. Look at line 32 which seems to preclude any accommodation to the people who are being displaced. RB:: There are Jews today who still take this literally and do not mix with “the other.” PC: We can now reject this totally which says something about Judaism today. 24: 1 Come up to the Eternal… and bow low from afar. Moses wrote down all of the commands of the Eternal. The blood of the covenant is splashed on the people. When you behold G you can engage in eating and drinking. Moses remains on the mountain forty days and forty nights. LL What is the pedagogic intent here? Why is Moses going up the mountain several times? RB: Note that 40 years is a generation whereas 40 days is just a long time. The appointment of Aaron and Hur to determine legal disputes indicates the importance of law in the society – and even today. Note that there is some language here which suggests that a fetus in not a person. Note also that the eye for an eye principle is actually a relaxation of an earlier practice where an entire village could be wiped out in revenge for the killing of one person. See Essays on page 526 of Plaut. Rabbi Paul Golomb filing in for Rabbi Lean Berkowitz. In the Hebrew (right side of the Plaut text) there are two sets of cantellation marks. One is used for private readings and the other for public. Note the half tone page. The term “Decalogue” means ten utterances. Not “commandments.” Or even obligations. Protestants and Catholic versions of the Decalogue start with “you shall have no other gods before me” whereas here it is “I am the Eternal your God.” The former is clearly a commandment whereas the latter is a statement. Note the way this is broken up into ten statements but they do not comport with the verses. Normally at the end of a verse in a printed text there is a colon. See verses three through six – no colon until the end of six – effectively turning it all into a separate statement. Verse thirteen has four colons – turning it into four statements. In the Hebrew there is a colon at the end of every verse – which creates an ending for the listener. Making a statement conjunctive or disjunctive can make for different meanings. 26:4 No sculptured images – the third and forth generations shall be punished for violations. The fear of G is basic here but consider who is being addressed – these are a people who are new to these notions and hence the use of hyperbole. A more carefully reasoned explanation would come later. Recall that G spoke to Moses from the burning bush by saying “I am the G of your ancestors.” Abraham Isaac and Jacob are mere abstractions at this point to these people. Here they are reminded that this is the G who brought them out of Egypt. 26: 7 You shall not swear falsely. LL This is foundational to having a system of government and justice that is predicated on laws. PG It also makes clear that one cannot swear by any other authority. 26:8 Keep the Sabbath day holy and do not work. The definition of “work” has proved problematic. Most of Jewish practice comes from the Talmud where there is extensive discussion about what constitutes work. The Orthodox have a principle that the well being of the individual comes first so the rule can be bent. Shabbat in an absolute sense is unobtainable. The best we can do is try to adhere to the law. Consider the Shabbat elevator which stops at every floor. Compare the information in 26:11 to the opening lines of Genesis. Are these words familiar to the people? We as the readers are privy to this information because we have read Genesis. Note the use of the seven day cycle which becomes intrinsic to society. 26:13 You shall not murder, commit adultery, steal, bear false witness. The half tones in the Hebrew denote spaces between each of these sins. 26: Do not covet your neighbors house etc. or anything that is your neighbors. But isn’t this an emotional reaction? And therefore unavoidable? But we cannot translate this emotion into action. Note that the commandment as to Shabbat is out of step with the others. The others are immediately obvious and learned in kindergarten. All of this is somewhat banal except keeping the Sabbath holy. This is the only piece of revelation that is truly revelatory.